This is a comprehensive listing from all contributors, with their kind permission. In no way do I accept the credit for all the fine work from the other artists..
A. Included is Regs/Cathartes excellent rotating artwork to date, in zip form by folder date. The rotating artwork are in folder form already, and only need the folders unzipped to the game Art folder. Nose art has been added to some plane side art. Plane side and top replacement art unzips straight to the game Art folder. As sub directories in the game Art folder create two folders. Name them AlliedPatch and JapPatch (no space between the words). Unzip the bitmaps to the respective sides folder. C. TF Mission Art unzips to the game Art folder. 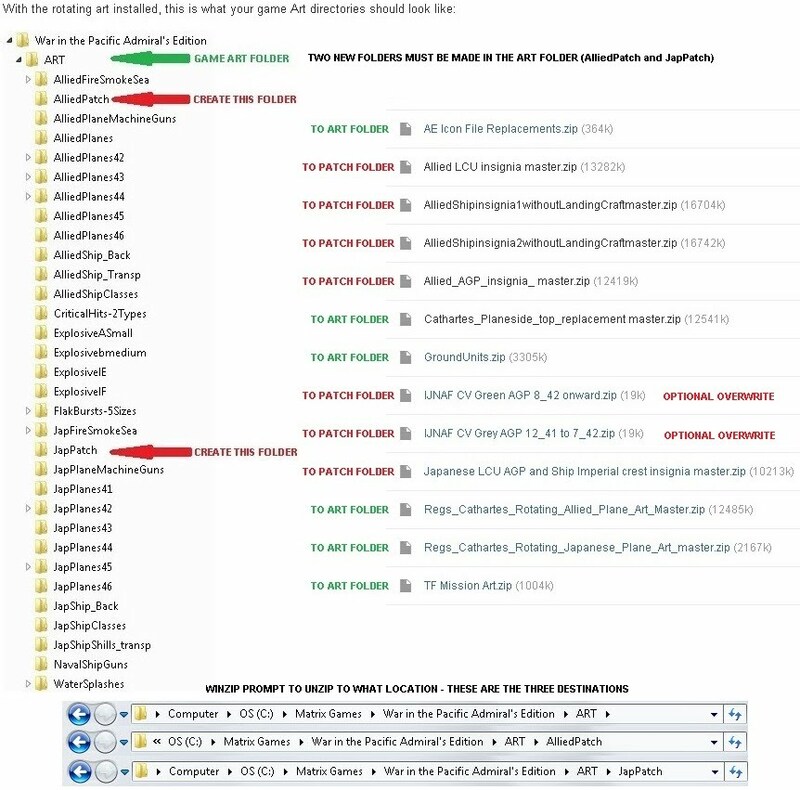 D. Icon file replacements unzip to the game Art folder. These are the ingame icons with, AF's, Ports and TF's recolored for a more natural look to the game map. The Japanese TF's show up as flagged icons. Some nationalities are renamed, showing different color ID's than stock icons. E. Ground unit zip replaces sepia colored stock LCU pictures with colored ones. Unzip to the game Art folder. G. Alternate bitmaps must be renamed to appear properly in the game. H. Always be sure to back up your original in game art.